Tea - Sweet Dew from Heaven - China Restaurant ZEN in Adliswil, near Zurich. Famous for Peking duck and authentic Hong Kong style dim sum with organic ingredient and vegetarian menus. At ZEN, we serve tea in an original Chinese tea service. 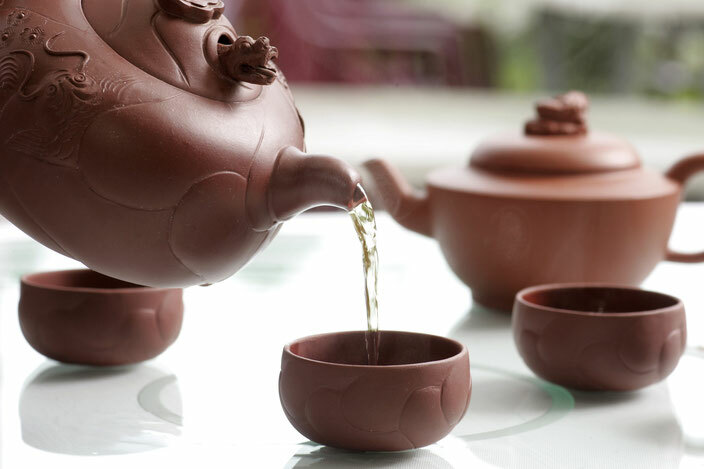 It is made of Zisha-clay, which can only be found in this quality in the region of Yixing, northwest of Shanghai. For centuries, this material has been famous for permitting the tea to develop its flavour particularly well. In the course of time, the ceramics absorb the aroma and flavour of the tea through continuous use. The crockery retains temperature exceptionally well, yet it does not get too hot on the outside, which makes it easier to hold. Yixing tea crockery was manufactured for the first time during the Sung dynasty (960 – 1280 A.D.) and became famous during the Ming dynasty (1600 A.D.).